Suzie Derrett is a dynamic, successful businesswoman who lives in BC, Canada. She is a whirlwind of energy and wisdom – and you could say that she is someone who can’t be messed with. Cancer tried to mess with her – twice - but lost. It also tried to mess with her husband. It lost again. And then it went too far, and tried to mess with her youngest daughter. Guess what? It lost yet again. Yes, that’s right: Cancer lost to Suzie. Four times. 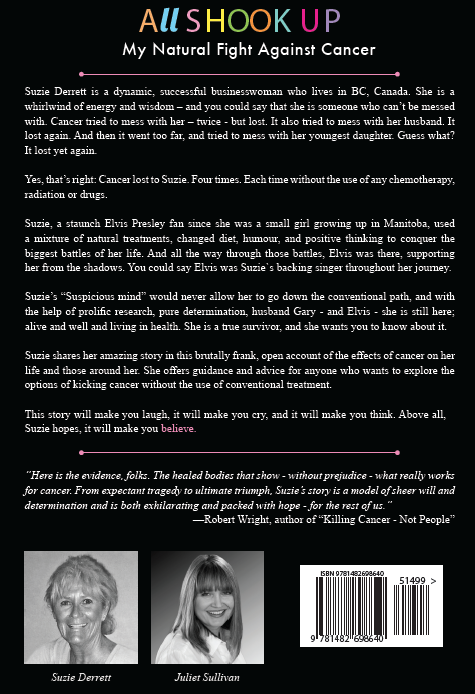 Each time without the use of any chemotherapy or radiation.. Suzie, a staunch Elvis Presley fan since she was a small girl growing up in Manitoba, used a mixture of natural treatments, changed diet, humour, and positive thinking to conquer the biggest battles of her life. And all the way through those battles, Elvis was there, supporting her from the shadows. You could say Elvis was Suzie`s backing singer throughout her journey. Suzie’s “Suspicious mind” would never allow her to go down the conventional path, and with the help of prolific research, pure determination, husband Gary - and Elvis - she is still here; alive and well and living in health. She is a true survivor, and she wants you to know about it. Suzie shares her amazing story in this brutally frank, open account of the effects of cancer on her life and those around her. She offers guidance and advice for anyone who wants to explore the options of kicking cancer without the use of conventional treatment. This story will make you laugh, it will make you cry, and it will make you think. Above all, Suzie hopes, it will make you believe. Find out how Kangen Water had a major role in this story. This book will help you help others and help them understand about the water.